A quick update to encourage our readers to connect with us on Facebook and Twitter. We tend to flag up discount vouchers, special offers and new restaurant openings via our social networks as they are more suited to short, quick updates that are often time limited. 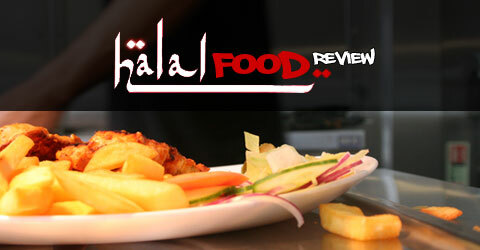 To join us on Facebook visit http://www.facebook.com/HalalFoodReview and click like, it really is that simple and will only take a few seconds. Salaams and welcome back to the Halal Blogosphere where we continue to celebrate Eid. This afternoon we took the family for their first Chicago experience. The food was brilliant as ever and the kids loved it. After the excesses of the day before we stuck to the tried and tested Jacket Potatoe and Strips meal. For those of you who have not eaten there this includes a jacket potatoe with cheese and spicy beans with a side salad plus strips of your favouite burger patty where you can choose from various fish, chicken and lamb options. The meal also comes with a drink and a dessert. If I had to be critical the dessert offering of a tub of custard or creamed rice is really not that inspiring and feels a bit out of place with the other elements of the menu. The kids shared a very generous portion of jacket fries and chicken nuggets. A big thumbs up to the Chicago crew and a special shout out to their staff who seem to be on first name terms with most customers. In conversation with the staff there is talk of refreshing the menu at some point. I’d definitely recommend introducing a milkshake and ice cream menu as part of the dessert offer as well as a selection of cakes and bakes. This is the only part of the offer that I really do think could be improved upon. If you’ve not tried out Chicago, we’d definitely recommend it! Until the next time happy eating! Salaams and welcome to the Halal Blogosphere, inshallah our readers from around the world have or are celebrating Eid! We’ve had a biriyani overload today which we had to sleep off during an early evening siesta! To satisfy our taste buds this evening we hit Chop N Wok in Shirley. The team were in the process of closing for the day and I wouldn’t blame them for thinking why did these guys come in when they did. We initially had 5 minutes to eat our meal but all credit to the staff they hung around so we could eat at a more leisurely pace and having a chat with the waiters at the same time. The great thing about the Shirley branch is it stays open a bit longer until 11pm but you need to get last orders in by 10.30pm. Also I noticed Shirley do a kids menu too, I can’t remember seeing that in the city centre branch. This blog entry is our first trial with our new smartphone courtesy of the wonderful team at HTC, so you can look forward to seeing more short and sharp updates in full technicolour! In the meantime enjoy your Eid and may your prayers and duas be accepted! Salaams and welcome back to the Halal Blogosphere where we have spent the last two days in the company of the highly entertaining and very engaging Aman Ali a Muslim Comedian from New York who is currently on a Europe wide tour. For those of you who may not be familiar with Aman Ali he is also one half of the duo behind the incredible 30 Mosques in 30 Days project which in our humble opinion is one of the most innovative Muslim led cultural awareness projects we have ever seen. We’ll be sharing some of Aman’s thoughts, photos and videos from his time in Birmingham where he has been hosted by our friends at Soul City Arts who are based in Birmingham’s alternative arts space the Hubb. So sit back and enjoy Aman’s first video entry! With the credit crunch hitting our pockets it’s not easy to dine out on a regular basis especially if you’re taking the family out for a meal or are having to cut back on your spending to make your income stretch further as utility bills, petrol prices and general inflation goes through the roof! The good news is that halal restaurants are finally beginning to replicate the mainstream model and introduce a range of discount offers, money off vouchers as well as featuring on popular mobile applications such as Voucher cloud to make it easier for us to dine out whilst save money in the process. So how do you go about saving money on your meal. While firstly get yourself on Facebook and Twitter and connect with any restaurant that might have a digital platform. If a restaurant is going to offer a special deal it will most certainly use Facebook or Twitter to promote the offer. Tinseltown is an excellent example of a restaurant offering halal food that utilises the social media power of Facebook and Twitter. Its lightening Monday deals are a fantastic way of encouraging its customers to come back and try a range of different special deals that offer a big discount to what you would normally pay. The concept of offering the deal on a Monday is not too different from Orange Wednesdays and encourages people to go out on a day they might not necessarily associate with socialising or eating out. If you have a smartphone then make sure you download Vouchercloud which is a great application to help you save money on shopping, food, leisure activities and a whole range of other options. When we’re out and about in Birmingham we have no shortage of offers offering discounts at coffee shops, sandwich outlets, restaurants etc. The halal options are limited at the moment but that’s not the fault of Vouchercloud we need more of our halal restaurants to connect with social media. With every customer now likely to have a smartphone in their pocket its never been easier for someone to use an application to help identify where they can eat. If you can integrate a special offer to that interest then you’re more than likely to find yourself a new customer. At the Halal Food Review we have set up our Facebook page to connect not only with our readers but also the halal food restaurants so when we see an offer we can also share it with our readers. That really is the power of social media the ability to see something and share it with people you think would be interested. The other benefit of social media is the speed and simplicity in terms of letting people know there is an offer, we couldn’t possibly update the website every time we came across an offer but it’s incredibly easy for us to share an offer via Facebook or Twitter, it literally takes us one click. So if you’re interested in finding good food at an even better price then join our Facebook or Twitter community using the buttons below or the top right hand corner of the site. Also a call out to our readers who are active on Facebook and Twitter as well as any restaurants. If you are aware of an offer or are running an offer let our community know by sharing the link or tweeting it. Whilst we try and keep up to date with things its impossible to catch everything and that’s where even the Halal Food Review can benefit from the social reach of our readers. Just in the last couple of weeks we’ve been able to share with our readers how you can save money at Tinseltown, Guanabana, Archies and Peri Peri Grill and thats just the tip of the iceberg. I am sure there are loads of other offers out there so if you know of an offer a restaurant is running share it with us! If you like a page on Facebook or follow a Twitter account that we don’t just flag it up with us and we’ll add it to our network.